EIF2AK2 from other species may also be detectable. 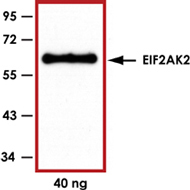 Sample Data :Representative Western blot with Anti-EIF2AK2 (1:1000) using 40ng of GST-tagged human recombinant EIF2AK2. 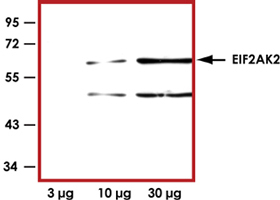 Sample Data :Representative Western blot with Anti-EIF2AK2 (1:1000) using 3 μg, 10 μg and 30 μg of Jurkat cell lysate. Scientific Background :EIF2AK2 (also known as double-stranded RNA-activated protein kinase) has been shown to be involved in HIV/gp120-associated neurodegeneration (1). EIF2AK2 acts as a critical mediator of gp120 neurotoxicity and is a substrate for a family of protein kinases that respond to various forms of environmental stress. Activation of EIF2AK2 leads to its autophosphorylation and then phosphorylation of its natural substrate, the alpha subunit of eukaryotic protein synthesis initiation factor-2. A novel cross-talk between the EIF2AKs and p53 has been shown that has implications in cell proliferation and tumorigenesis (2). 2. Alirezaei, M. et al: Human immunodeficiency virus-1/surface glycoprotein 120 induces apoptosis through RNA-activated protein kinase signaling in neurons. J. Neurosci. 2007; 27(41):11047-55.